Grab four of one color, and get those dedication tokens. Next try for three pair, and then (if necessary) one of each of the seven colors. This strategy will get you the most favor tokens with a given number of cards. The 10 point favor token for “one of each color” is tempting, but it requires seven cards. You can get two “four of a kind” favor tokens (worth 5-8 points each) with just eight cards. The compromise is “three pair”; for six cards you get a favor token worth 5-9 points. The Rules for two players state use five of each of the colored lantern cards and 16 lake tiles. That works quite well and makes for a quick and competitive game. Slow things down a bit by using six lantern cards of each color and ANY even number of lake tiles. The extra components will reduce scarcity of resources and extend the game a bit. Longer games mean higher scores and less time spent resetting the cards and tiles for a new game. Lanterns is well designed and works nicely with two, three, or four players. But I have noted (particularly in a two player game) that collecting “four of a kind” is easy when compared with “three pair” and “seven different colors”. It’s a cinch to ignore the combos that require six or seven cards, and focus on those needing four. To help offset the imbalance, try removing the seven and eight point “four of a kind” favor tokens and the nine point “three pair” favor token. Then the nine and 10 point favor tokens for collecting “seven different colors” will be more enticing. – Play for 4 of a kind when you can. It generally nets more points in the long run as you are using fewer lantern cards to score. – Play to avoid giving other players the ability to take lantern cards on multiple sides. – Play to run lantern cards out. It can give you an edge especially when your opponent needs those cards to make a particular score. – Play to give your opponents lantern cards which are no longer available. I’ve worked out a solo variant for Lanterns, because it is definitely enough of a puzzle to work solo. Here are the rules that I’ve come up with. My games so far have been challenging and I’m hoping others might provide feedback. – Whenever you place a lake tile, first take your lanterns, then place all of the other lanterns that would be distributed in a 4-player game in the Grandmaster’s tableau. 1. The Grandmaster will always take the highest scoring tile possible, whether this means using favors or not. 2. When using favors to exchange lanterns, the Grandmaster will always return a lantern of the most common color available. If there is a tie, the player may choose which color lantern to return. – Once you have checked scoring for the Grandmaster, you may then move on to your next turn. All other rules are the same. 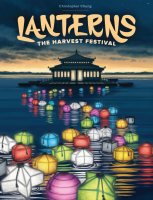 Lanterns: The Harvest Festival is a fast, fun, and fairly short game. We use all the lake tiles instead of the suggested number. Just make sure the number of tiles is divisible by the number of players, so each player gets the same number of turns. The extra tiles make the scores higher, and the game lasts a bit longer. That means fewer setups, which take a couple of minutes with the descending valued stacks of favor tokens.